Pet Bloggers Conference Keeps the Environment Clean: The BlogPaws conference is aiming to be 100% recyclable throughout the weekend, with their “Zero Waste” initiative. The conference is a place for pet bloggers to network with other bloggers and learn how to enhance their blogs. The Lazy Guide to Living That #ZeroWaste Pet Friendly Life by BlogPaws 2017 Zero Waste Ambassador, Jodi Chick. Ever since, their goal has been to reduce at much waste as possible at the conference. Partnering with Only Natural Pet and the Pet Sustainability Coalition to get this done, over the course of the conference staff worked hard to ensure attendees recycled where they could, composted whenever possible and made as little trash as possible. This year they were able to divert a whopping 96% of waste from the landfill and send the rest out to be recycled or composted. BlogPaws Conference Reduces Carbon Paw Prints in Record Numbers: Combined efforts at the BlogPaws Conference focused on achieving as close to a “zero-waste” event as possible, one that reduced the environmental footprint of the conference by diverting waste from the landfill, and by educating conference participants about waste issues related to the pet industry. Pet Bloggers Announce 2016 Zero Waste Project Results: BlogPaws, Only Natural Pet, and the Pet Sustainability Coalition (PSC) recently embarked on their second zero waste initiative during the BlogPaws Pet Blogger and Social Media Conference held in Chandler, Arizona, for three days in June. BlogPaws Poised to Go Green for Second Year: Sustainability involves methods that do not completely use up or destroy natural resources. No matter who you are, what pets you have, or how big or small your blog is, on this we can all agree: Sustainability is crucial to our planet’s future. BlogPaws Celebrates Earth Day 2015 with an unprecedented movement never before seen at a BlogPaws Conference. We are going green and plan to strive for a near zero-waste initiative in Nashville with our 500 attendees. BlogPaws, Only Natural Pet, and the Pet Industry Sustainability Coalition (PISC) announce a partnership to launch a zero-waste initiative for the 2015 BlogPaws Pet Blogger and Social Media Conference scheduled for May 28-30 in Nashville, TN. PSC and ONP Partner with BlogPaws: BlogPaws is the largest professional network of pet bloggers and social media enthusiasts. BlogPaws is a part of Pet360 Inc., an integrated media company devoted to everything pets, providing pet parents the trusted information, products and advice they need to raise happy, healthy pets. Now we’re adding “going green” to our list of achievements! Eco-Friendly Targets Pets and Their Parents: Here’s a basic primer on what you need to know, fun facts about why going eco-friendly is the right thing to do, and some ways on how you can get involved in preparation for the conference. 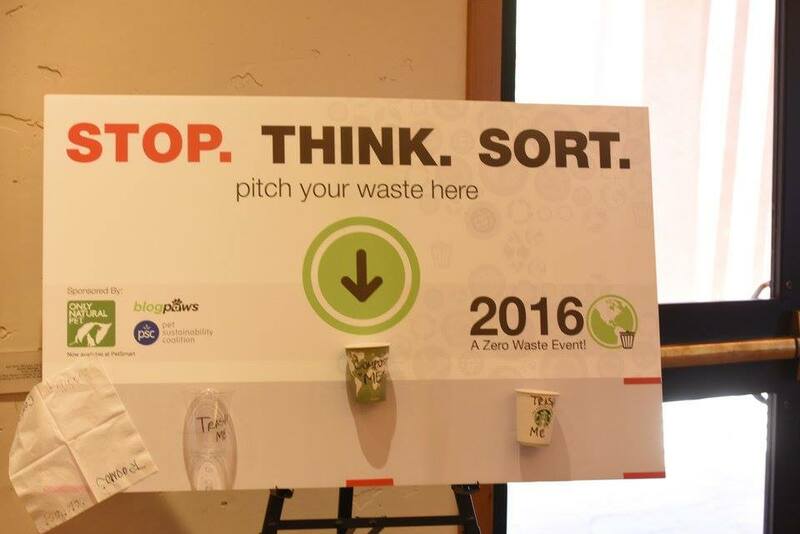 BlogPaws Aims for Zero Waste at BlogPaws Conference: Here on The Fill, we have written many articles about zero waste. Those articles mostly pertain to cities and companies and how they are contributing to the principle. However, in this edition, we would like to recognize a blogging community that is putting forth sustainable efforts in their seventh annual conference. BlogPaws Takes 2015 Conference to Greener Pastures: Official press release announcements 10/14/14 and Pet360 release.